Autumn is one of the most beautiful times of the year – the temperature drops and the trees change colour, leaving you with a picture perfect view. Even though the weather is cold and you are unlikely to be sitting out in your garden during the autumn, it’s important to keep your outside space well maintained and looking as smart as possible. As the leaves begin falling from the trees it’s a good idea to keep an eye on your gutters – especially if you have any trees close to your house. Clean your gutters out thoroughly so they don’t overflow when it starts to rain – water damage to your house is not cheap to repair. If you do find that your drainpipe is blocked, the easiest thing to do is stick a hose down the pipe and turn it on to help flush it out. Walk around your house and check that none of your drains are covered with leaves or rubbish. If they are clogged, then 100mls of neat bleach will help with the unclogging process. If the sun has taken its toll on your lawn during the summer, your grass will finally get a chance to recover during the autumn months. Your lawn will grow more as the rains begin, and therefore need mowing more regularly. Make sure you rake up all the leaves on your lawn so the grass can see the light, otherwise you may end up with brown patches. It’s a good idea to apply a slow release fertiliser to your grass in October too, as this will help develop a strong root system and thicker grass. Autumn is actually a really good time to start planting a selection of different fruit and vegetables. Broccoli, cauliflower, silverbeet, carrots, strawberries, and broadbeans are all good to plant in October and can be harvested in the spring. In order to maximise the flowering time of winter plants they need to be planted as early on in autumn as possible. Choose pansies, sweetpeas, and marigolds for a splash of colour, and go for lavender, ferns and hydrangeas to keep a good base of bushy plants. 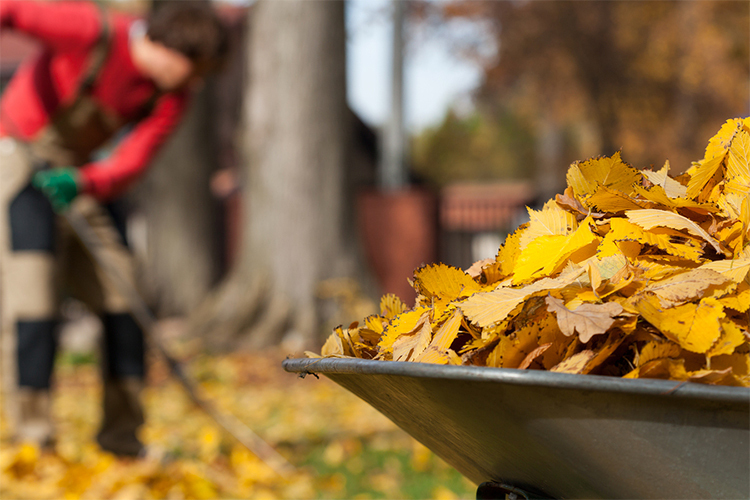 Once you have collected all the fallen leaves, you can put them to good use by composting them. Combine leaves, any grass clippings, manure, scraps of fruit and veg, and some water, and keep all the ingredients as balanced as possible for a really good compost mix. Help the compost decompose by turning it with a fork occasionally and letting the air get to it. Use the compost in your garden to give your plants some valuable nutrients and keep them growing nicely. As you won’t be doing as much gardening through the winter months, it’s a good idea to give your tools the once over and store them in a clean, dry place. This care and maintenance will make them easier to use when you get them out in the summer and will extend their lifespan. Sharpen and disinfect pruners, and lightly sand any tools with wooden handles. If any of your tools have become rusty then apply penetrating oil and scrub with steel wool to remove the rust. Oil all your tools to prevent rusting through the winter months and store them securely in a shed with a lock.